Charming, renovated house with 2 bedrooms for 6 persons. - costs for final cleaning. Our beautiful cottage of 90m2 has been renovated in recent years and completely refurbished with new furniture. The cottage has two bedrooms, electric heating and a wood stove. It also has a fast WIFI-connection and satellite TV. Suitable for 4 to 6 people. Possible sleeping accommodation for 8 people. Classification: On the ground floor entrance, a recently installed new bathrooms with heated floors, shower, toilet, two sinks and washing machine. The living room is furnished with a three seater sofa, armchair, coffee table, fireplace and TV. The dining area includes a new kitchen with refrigerator, dishwasher, microwave, ceramic hob and fan oven. There is also a coffee maker, kettle and toaster. There is a dining table with 6 chairs. There is also an additional sofa bed downstairs. On the completely renovated first floor two bedrooms are furnished. The master bedroom has a 2-bed and two single beds. The smaller bedroom also has two single beds. 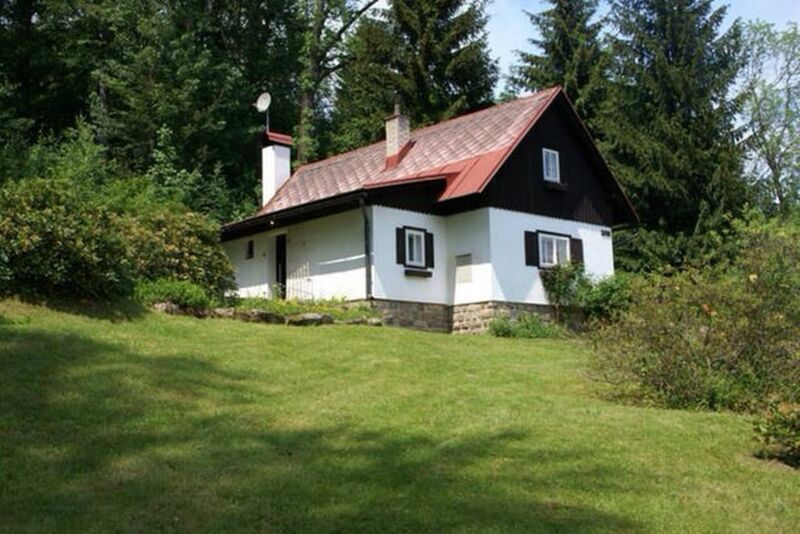 The detached cottage is located in a beautiful area on the border between the Jizera Mountains and the Giant Mountains in the Czech North Bohemia. Because the cottage is located on a slope, you from the beautiful, large, green garden surrounding the house, unobstructed view of the valley and the picturesque mountain scenery in the area. In the village of Velke Hamry you find an evening shop. But in the neighboring village Tanvald, 5 min. Drive, can be found three large supermarkets and numerous shops. There are also several restaurants in the area where you are good (and cheap!) can eat and drink. Guests have access to all rooms in the house, including the sheds. In the garden are two barns in which among others are stored garden furniture and wood for the stove. By the magnificent (protected) areas under the Iron Mountains and the Giant Mountains, this area both summer and winter ideal for various activities and trips, with or without children. A visit to the bigger cities, such as Liberec and Jablonec nad Nisou, is recommended. Even a trip to Prague is very easy to do (about 1 hour). In the summer there are many excursions to charming villages and castles in the area. The area is very suitable for short and long walks through the beautiful mountain scenery. Also, golf and cycling is often done here. The Iron and Giant Mountains are the perfect areas for the winter enjoy winter sports. In the neighboring village Tanvald is a beautiful ski area with several lifts and long runs. About half an hour away you can find the larger resorts of Harrachov and Rockytnice nad Jizerou. The largest ski areas in Spindleruv Mlyn and Pec pod Snezkou can be found approximately 1 hour. There are 2 electric radiators both upstairs and downstairs. Parking next to the cottage. Parking in the winter only along the road. Satellite TV with channels that broadcast via satellite Astra 3. Several small and large ski areas can be found in the immediate vicinity of the cottage. Equipment can be rented on site. We were a bit concerned when we arrived at the property to see peeling paint by the front door, and the windows and shutters covered with a lot of very dusty cobwebs. However, the house was fine inside with a nice kitchen diner, though as flagged up the stairs are not for those with any sort of mobility problem, or for children as they are steep, a bit awkward and have no hand rail. Bedrooms are basic but OK. The key holder was very pleasant and helpful, even though he spoke no English or German and we spoke no Czech! Having booked the house, we were somewhat irritated to find that we had to bring our own bed linen and towels, which had not been mentioned on the web-site, and we probably not have booked the house had we known this as it was a suitcase full we would not have expected to bring. Fortunately we were coming by car, not on the plane. I understand that this has now been put right on the web-site. Please note that the main bedroom has two single duvets rather than a double one. Strangely, even though the house has a washing machine, there is no iron or ironing board. Quiet attractive location, and we had lots to do. Enjoyed using the train at Tanveld, which saved driving the car. This house was very comfortable and well-equipped with everything we needed as a base for our 2-week summer holiday in the Czech Republic and for driving to nearby countries. It would also be a good choice for a winter holiday, as the pretty mountain ski resort of Harrachov is a very short distance away. The cottage sits in a nice, quiet, wooded and secluded setting, on a hillside but it is not totally isolated from neighbours nearby. It is situated on a small country road (leading directly to Tanvald) just outside the village of Velke Hamry. It is an easy 2-hour drive from Prague Airport, mostly on motorway. Velke Hamry itself (like many other places in the Czech republic, which suffered from neglect under Communism) is rather run down, with some formerly beautiful but now dilapidated buildings. Tanvald has a few supermarkets and it is also a fairly short drive to Liberec, a larger town with more amenities. Bear in mind that the roads can by windy, local speed limits are very low and the Czech drivers abide by them religiously. Therefore, getting anywhere can take longer than anticipated. The cottage is ideally located to allow day trips to various local attractions, as well as further afield to Prague, Dresden (Germany) & Wroclaw (Poland). There is much to see and do in the area and there is also a wonderful and affordable array of Bohemian glass and crystal (still made in some factories in the vicinity) available to purchase from local shops. When visiting Prague, we would strongly suggest you use the park and ride facilities at Cerny Most and take the metro in and out of the city. We found this the most stress free way to visit. The arrangements for arriving and leaving the house were very straightforward and Ivan, the key manager, was very helpful (despite our inability to speak Czech!). The owners of the house were very friendly and accommodating, in helping to arrange our stay. This was our first trip to the Czech Republic and it proved interesting, enjoyable and memorable and we may be back. We would warmly recommend this cottage and location, if you want to see the real Czech Republic and also take in the busy tourist sights of Prague. Thank you very much for your very detailled and positive review. We hope to have you back as a quest in the future. Wir hatten ein paar schöne Tage im Ferienhaus. Ruhige Lage, zum erholen in der Natur perfekt. An- und Abreise lief problemlos. Vielen Dank! Sie sind sehr willkommen. Ein wunderbares kleines Haus am Hang gelegen. Das Haus ist super ausgestattet und bei Bedarf ist der sehr nette Hausmeister umgehend zur Stelle. Die Umgebung lädt zu Ausflügen in die Berge mit reichlich Schnee, tollen Wäldern, Wasserfällen und leckeren Cafés ein! Leider können wir dieses Urlaubsdomizil nicht gut bewerten, da einige Vorkommnisse einen entspannten Urlaub beeinträchtigten.Laut Beschreibung haben wir Bettwäsche/Handtücher/SAT-TV gebucht. Nach der Buchung haben wir ein „Handbuch“ zur Unterkunft erhalten, in der auf einmal steht das Bettwäsche und Handtücher selbst mitgebracht werden müssten. Nach Rücksprache mit dem Vermieter verwies dieser auf das Handbuch welches man aber ja erst nach der Buchung erhält, sodas wir doch wieder Bettwäsche und Handtücher für 5 Personen mitschleppen mussten obwohl wir diese Dienstleistung bezahlt haben. Am Urlaubsort angekommen und bei Besichtigung mit dem Verwalter,stieg uns gleich ein starker Geruch in die Nase worauf wir die Sicherung für den Boiler im Auge behalten sollten. Kurz nach Abfahrt des netten Mannes kam Qualm aus einen der Steckdose für die elektrischen Heizkörper im Essbereich und es wurde dunkel. Nach langem telefonieren und sms‘en hat sich der Verwalter den Schaden angesehen und konnte ihn mit Hilfe eines Bekannten reparieren.Vorsichtshalber haben wir die Sicherung für die Heizkörper den ganzen Urlaub über, ausgeschalten wenn wir schliefen bzw. unterwegs waren. Zum Schluss noch zum leidigen Thema SAT-TV. Nach mehreren Versuchen deutschsprachiges Fernsehen zu finden haben wir dem Vermieter unser Problem gemailt und es kam auch relativ schnell eine Antwort mit verschiedenen Anweisung, daß ganze ging dann 2 Tage hin und her mit dem Endergebnis das die Anlage gar keine deutschen Sender sondern nur holländische empfängt. Fazit: wir kommen nicht wieder! Vielen Dank für Ihre Antwort. Leider ist das, was Sie über Bettwäsche sagen, falsch. Wie auch erschienen ist, nachdem Sie eine Beschwerde bei der Mietwebsite Homeaway / Ferienwohnung eingereicht haben. Zum Zeitpunkt Ihrer Buchung haben wir keine Option zur Buchung von Bettwäsche angeboten. Sie haben dieses Missverständnis auf die aktuellen Informationen auf der Website gestützt. Wir bieten diesen Service nun unseren Mietern an, dies war bei Ihrer Buchung vor 9 Monaten nicht der Fall. Wir versuchen immer sehr klar zu sein, was Sie als Mieter erwarten können. Deshalb senden wir Ihnen nach der Buchung eine ausführliche Anleitung unseres Hauses. Diese enthält dieselben Informationen wie auf der Website zum Zeitpunkt der Buchung. Unser Angebot kann sich im Laufe der Zeit ändern, wodurch sich auch die Informationen auf der Website ändern. In diesem Fall haben wir begonnen, unser Haus inklusive Bettwäsche zu vermieten. Hierfür berechnen wir auch Kosten. Zum Zeitpunkt Ihrer Buchung hatten wir diesen Service noch nicht. Sie haben also sicher nicht dafür bezahlt. Sehr schade, dass Sie jetzt dieses Argument verwenden, um Ihren Fall mit einer schlechten Beurteilung richtig zu machen. Wir können den verbleibenden Teil Ihrer Einschätzung nicht von den Missverständnissen bezüglich des Vorstehenden trennen und erkennen uns in Ihrer Einschätzung nicht an. Wir fühlen uns auch durch die allgemein sehr guten Bewertungen unserer anderen Mieter gestärkt.